"Secret Weapons to D.I.Y. Kitchen Remodeling Success"
FOR A 50% OFF PRICE IN YOUR CART! SALE ENDS IN A FEW HOURS! Attention Do-It-Yourself Individual: Whether you want to remodel your kitchen entirely yourself or want to act as the general contractor and use subcontractors to do some or all of the work for you, I can help you make your kitchen remodeling project a smooth success! I want to help you make your "do-it-yourself” kitchen remodeling project a huge success! I personally have remodeled more than my share of kitchens over the last 17 years. I am now offering A COMPLETE KITCHEN REMODELING TRAINING VIDEO SERIES to handymen everywhere! I have put together these video trainers to help the "handyman inside you" successfully remodel your kitchen with outstanding professional finished results! You're going to love what I've put together for you. At the bottom of this page are more Kitchen Training Videos for you to choose from. Every phase of Kitchen Remodeling is available for your training! Thanks for stopping by my D.I.Y. Kitchen Remodeling Store! KITCHEN PRO VIDEO A TO Z TRAINING VIDEOS! This very detailed, step-by-step, Kitchen Training Video Series will step you through everything you will need to do during the entire kitchen project from start to finish. This training video series will show you exactly how to successfully complete all phases of your kitchen project just like a Pro's! You will not be "left in the dark" about ANYTHING pertaining to your kitchen remodel project! 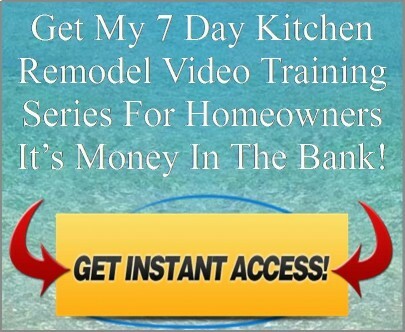 These videos are SLAMMED full of incredible step-by-step video training footage that will reveal EVERYTHING you need to do to "remodel your entire kitchen"...GUARANTEED! LEARN HOW TO "TEAR-OUT" YOUR OLD WORN OUT KITCHEN! HOW TO INSTALL ALL OF YOUR NEW CABINETS LIKE A PRO! HOW TO INSTALL A NEW KITCHEN TILE FLOOR THAT IS AMAZING! The Videos were shot on client job locations of my remodeling company. These are actual "real time" construction videos of one of the nations top remodeling contractors in action. THESE TRAINING VIDEOS WILL GIVE YOU ALL THE PROFESSIONAL GUIDANCE YOU WILL EVER NEED TO REMODEL YOUR KITCHEN JUST LIKE A PRO! "OWNING THESE VIDEOS IS JUST LIKE HAVING A MASTER CARPENTER, ELECTRICIAN, PLUMBER, AND KITCHEN DESIGNER STANDING RIGHT BESIDE YOU SHOWING EXACTLY WHAT TO DO NEXT TO AVOID COMMON ROOKIE MISTAKES! THESE VIDEOS ARE PRICELESS AND WILL PAY FOR THEMSELVES 10 TIMES-OVER BEFORE YOUR DRYWALL IS EVEN HUNG!" Over 28 Hours Of Intense Kitchen Video Training! 22 INDIVIDUAL ACTION PACKED VIDEOS INCLUDED! A $590.00 VALUE IF PURCHASED SEPARATELY! "From Day 1 of Your New Kitchen Project I Will Be Right Here With You!" This Product Is An Instant Download! NO SHIPPING! WATCH IT NOW! Take advantage of my "Do-It-Yourself" Kitchen Pro Video A to Z Package and I Guarantee you will save at least $5,000.00 to $10,000.00 (or more) in Reputable Contractor Fee's When You Successfully Remodel Your Own Kitchen. "I Guarantee It!" Kitchen Pro Video A to Z Training Package! Just watch the Kitchen Pro A to Z Training Videos and do things EXACTLY as they instruct you to do! These Videos will prove to be the Biggest SECRET to your Kitchen Remodeling Success! You will soon be enjoying your brand new Kitchen with family and friends, knowing that you just saved THOUSANDS OF DOLLARS in contractor fees! SALE ENDS NEW YEARS EVE AT MIDNIGHT! WARNING: ATTEMPTING TO REMODEL YOUR KITCHEN YOURSELF WITHOUT THE ASSISTANCE OF THE KITCHEN PRO A TO Z VIDEO TRAINING PACKAGE MIGHT BE HAZARDOUS TO YOUR HEALTH, YOUR HOUSE, AND/OR YOUR BANK ACCOUNT! Content copyright 2010-. D.I.Y Digital Info All rights reserved.